I’d just like to clarify that the below information was not from me. It’s from registered NeoGaf forum poster chubigans. I thought it was very well put together and a very good read on the state of Sony, Microsoft and Indie developers. It’s caused quite the debate on the forums, leading to a 19 page thread (at the time of shamelessly copy/pasting it here) and even has had feedback from the official ID@Xbox who are reading over the thoughts within the thread. “I’ll be honest, the thing I worry about is I look at all the people who buy an Xbox and invest their time and money in Xbox One,” he said. “Millions of people own Xbox One and I want those people to feel like they’re first class, because they are. “When a third party game comes out it comes out on all platforms at the same time. When indie games come out, I want them to come out and I want Xbox to feel like it is a first class citizen when an indie game launches. This generation has been amazing for game development. As a game dev working on two unannounced games, I’m thrilled that Steam, MS, Sony and Nintendo have revised their indie stances and have made game development easier and better than ever in making titles for their platforms. However, there is one remaining issue that is crippling game development on one specific platform: the Xbox One. I’d like to take a moment to explain what that issue is, how it has affected development, and what can be done about it. What is the Indie Parity Clause? The indie parity clause dates back to the Xbox 360, where MS mandated that you could not release a game on the 360 at a later date than any other version without having exclusive free content for Xbox owners. Since the launch of the XB1, MS has revised that policy for the worse. Now that loophole is closed, and devs are not allowed to release an XB1 version of their game, period, if they have already released it on PS4. At the time of the indie parity announcement, MS allowed games that were already announced for PS4 to be released at a later date on XB1. Those games included Contrast, Warframe, and many other PS4 launch window titles. There are now no more titles that fall under this loophole. There are three ways around this clause. The first is to release your game simultaneously on PS4 and XB1. The second is to launch first on XB1 and release a PS4 version later. Finally, the third is asking Phil Spencer for a free pass, which has NDA’d guidelines and specifics that I cannot get into, nor know the specifics of. Why would this hurt developers? Indie devs typically have small amounts of staff, and tend to “roll out” games gradually on a number of platforms. While the architecture of XB1 and PS4 may seem similar enough, it’s incredibly difficult to simultaneously develop for both platforms at the same time. First off, each one has their own certification process and requirements. One build may pass on one platform, but fail on the other. You have to constantly revise release date estimates until both versions are in line with each other, and even then, you’ll have platform specific bugs that you’ll have to fix at the same time once both versions launch. It is a bit of a nightmare, to say the least. That’s why many devs opt to focus on one platform, typically the biggest one (Steam), and then go from there. Why not develop for XB1 first? This is inherently why the parity program exists: to give XB1 exclusive games without the need for exclusive marketing or financial deals. But yes, that’s a question that cannot be universally answered. Many devs have their own personal reasons. I can only share my own. I applied to both the ID@Xbox program and the Sony developer program back in Feb. While both programs are fantastic and have great people behind them, I was able to get my Xbox One dev kit first by a few months. Theoretically this should have allowed me to get started on an XB1 port of my game except for one issue: the engine I use, GM Studio, would not be supporting XB1 until later this year. PS4/Vita support was already built into the engine. So, I started studying PS platform requirements, APIs, and GM Studio integration in preparation for my dev kits which I received last month. Through no fault of my own, I was developing first for Playstation because that’s the engine that was available to me via GM Studio. My PS4 game will be ready much earlier than my XB1 version. And despite having an XB1 dev kit, MS doesn’t want my game at a later date. They want me to delay my PS4 version until I can get the XB1 version out the door. And that’s impossible for me to do from a scheduling and financial standpoint. And so, just like that, I’m unable to make XB1 games, even though I very much want to. Even though I’m an ID@Xbox dev. Even though I have a dev kit right here next to me. I could talk to Phil and tell him my situation, and maybe, just maybe he’ll grant me a pass. It is ludicrous that I have to plea with MS to slip me through the door. Hence why I’m creating this topic, so that MS will maybe revise the parity clause not just for me but for everyone wanting to make XB1 games. Doesn’t MS provide free dev kits and free engine licenses? Shouldn’t they be able to call the shots in terms of releases? Absolutely agreed. However, the option to purchase our own dev kits and have our own release schedule doesn’t exist. There is no way around the parity clause. (Sony also offers a number of free engine licenses like MS, none of which tie into any sort of exclusivity or parity clause). Is this really causing any issues? Won’t indies come to MS at some point in the future? At one point earlier this year, I too thought that indies would eventually have to do a multiplatform release or exclusive XB1 release. Many said that the games would balance themselves out by 2015 and we’d see an even number of games being announced for both PS4 and XB1. -Official announcements, and not derived from PEGI ratings or retailer listings. -Announcements for ports of games from PC or older gen consoles were included in this list (such as Thomas Was Alone for PS4/XB1). -Japan only and China only releases were not included in both of these lists. Now let’s break down these lists. There were 66 total games announced for PS4 since 9/1. Of those, 47 had no mention of an XB1 release on the developer’s website or social media channels (one of them being first party/Sony published, bringing it down to 46). If we were to take out all Playstation Experience related announcements, if the argument were that those titles would only be announced for PS4 at that time since it was a PS exclusive event (despite the fact that two of those PSX announcements were also announced for XB1), that still leaves 33 titles with no XB1 release plans announced. On Microsoft’s side (which were considerably harder to get since MS doesn’t have an official blog style channel for ID@Xbox, so I had to cross reference all titles announced on the PS Blog and use fan sites like Pure Xbox and others), 24 games were announced. Of those, four had no mention of PS4 release plans. We can most likely nail down two of those titles as XB1 exclusive as they’re Kinect only (Boom Ball and Infinity Blade). How, exactly, is the parity clause helping to bring exclusives to XB1 again? Absolutely untrue. Microsoft sometimes asks to look at formal press releases, but no where in the official ID@Xbox guidelines or provisions does it say that you should hold back announcements for any kind of event. Obviously if an event is coming up you’d want to hold back your announcements, but there were no planned major MS events through E3 2015 since September, the date when that could have affected announcements. How do you know all of these titles are PS4 exclusive? Can’t they announce their also coming to XB1 at a future date? I don’t know if they’re exclusive, and they certainly can announce XB1 versions at a later date. That is not usually how game announcements are handled. When you announce your game for the first time, you want to make sure you’re getting the biggest possible audience. To include the XB1 is to double your coverage on XB1 media sites and channels. You want everyone to know about your game. Some pay PR companies to distribute their releases and try to get as much coverage as possible. To exclude the XB1, for no reason other than to make another announcement later in the future, makes no sense whatsoever, which is why so many devs don’t do it. Is it possible announcing on the PS Blog prevents devs from announcing an XB1 version elsewhere on the same date? No. 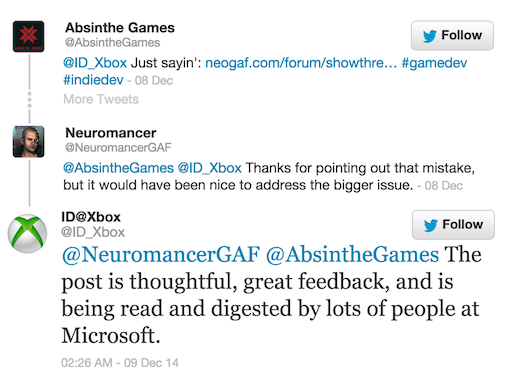 Again, many devs choose to also announce the XB1 version outside of the PS Blog using their own social networks. The reason devs don’t post about the XB1 version on an official site is because one doesn’t exist. Xbox Wire is only for major PR releases, Major Nelson’s blog is only for releases and not previews, and ID@Xbox blog is used for ID@Xbox related news but not new game news. The only social channels MS has available for indies are retweets on their major accounts like Major Nelson. That’s the reason why devs opt to use the PS Blog when revealing their newest game. Is the indie parity clause preventing all these titles from being released on XB1? I don’t know. Certainly it is a major factor for many. If MS were to tear down the parity clause tomorrow, there’s no guarantee that it would allow for all these games to make XB1 announcements. What I do know is that, for a large majority, the parity clause is preventing future releases on XB1. Whether that applies to the list of titles above I can’t say. I like that Microsoft is curating indie releases, saving the best for XB1, unlike PS4. They aren’t doing that. There’s no curation whatsover, and in fact, they’ll accept any game you want to put on the store, same as Sony (as long as it’s at a minimum acceptance quality, on par for both PS4 and XB1). The idea that MS is cherry picking games to release on XB1 is completely false. If there’s anything to take away from this thread, it’s this: the parity clause has failed. Many games have been announced for 2015 on PS4 alone without a mention of XB1. There will be more to come. It’s time for Phil Spencer to do what he has done so well this year and get rid of a policy that is strangling the XB1’s game release list and help foster game announcements for XB1 in the future. I’m tweeting Phil Spencer (@XboxP3) this thread in the hopes that he’ll give it a look. Who knows if he will, but I certainly hope he does. I want to make XB1 games. Many indie devs want to make XB1 games. MS has given us the tools to do so. The ID@Xbox program is a great service with a bunch of terrific people running the show. But the indie parity clause is preventing many of us from focusing on the platform. Phil, we clearly want to make games for your platform. Why do you continue to prevent us from doing so? I don’t like the parity clause, I don’t see the point in it. 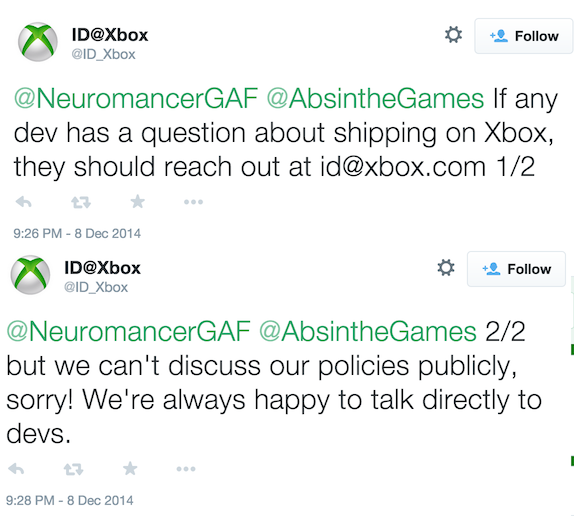 It’s only hurting the XB1 line up and potentially hurting indie developers. I thought the ‘no games’ thing was more of a PS3 thing, because for a long while it was lacking.